Links to the Union Square Greenmarket, and a couple of sites that describe the delight of it all, Essential New York and What Is Fresh. 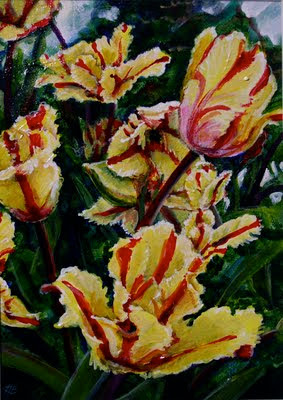 This is a 5" x 7" acrylic painting on gessoed and lovingly textured mat board. Sealed with a gloss clear coat and delivered in a cream-colored 8" x 10" mat, ready for framing. The text above is handwritten by the artist on the back of the painting. This is part of an ongoing series of small works, paintings with prose and poetry, that was started in June 2007. Visit my Etsy shop for full floral array. . .
Or visit my store on EBay for auction adventures. . .